By pretty much any standard I can think of, 2015 has been a poor year for cinema, at least so far. While we've had several great films, which were highlighted last week, it feels like more often than not, the films of 2015 have been mediocre at best and absolute trash at worst. This week, we're going to celebrate the bottom of the barrel - the trash that is so awful it sticks there even when you try to dump the trash into a dumpster. Sorry, we're getting off track. To the list-mobile! Directed by Chris Columbus. Produced by Adam Sandler, Chris Columbus, Allen Covert, Mark Radcliffe, and Michael Barnathan. Written by Tim Herlihy and Timothy Dowling. Release date: July 24, 2015. The more I think about Pixels, the less I like it. Truth be told, by the end of the year it could wind up lower on this list than it currently is. 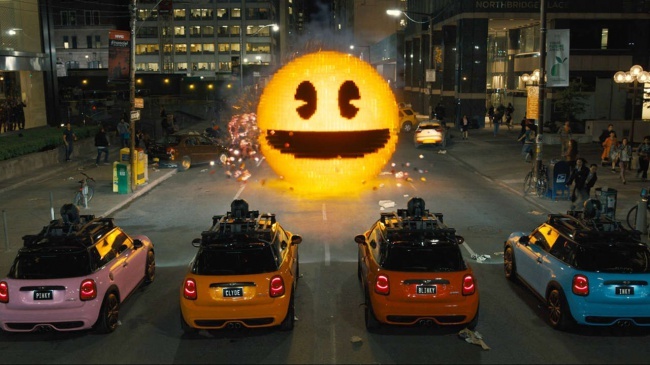 Pixels gives us an interesting premise and ruins it by turning it into a generic Adam Sandler comedy, complete with a mean-spirited tone toward its subject matter, so few jokes that it's hard to tell it's even a comedy, inconsistent in-universe rules, and bland characters for whom it's impossible to root. The only thing that saves it, right now, is its visual effects, which are interesting and not the type that you see every day. They don't save the movie from being a boring slog, but at least there are occasionally things to watch.